— Eric Turner on Tuesday, April 7th, 2015 in testimony before the Senate Judiciary Committee. By C. Eugene Emery Jr. on Sunday, May 24th, 2015 at 12:01 a.m.
One proposal before the General Assembly would restore the state's ban on all fireworks, a prohibition that was in place until the legislature and Gov. Donald Carcieri lifted it in June 2010. The ban was eased to allow sparklers, spinners and smokers to be purchased in stores. Fireworks that explode or fly through the air remained illegal, although you wouldn't know it during the weeks surrounding that Fourth of July, when the number of neighborhood fireworks displays seems to have, well, skyrocketed since sparklers became legal. During a hearing on the bill, S-431, a comment by Eric Turner sparked our attention. He's director of governmental affairs for American Promotional Events, which sells fireworks under the name TNT Fireworks. Turner argued against the Rhode Island bill, saying the experience in Connecticut, which began allowing sparklers and other "consumer" devices, shows the public is actually safer when such products are legal. "When the public is permitted to use sparkling devices as allowed in Rhode Island, they're less apt to go after illegal products," Turner told members of the Senate Judiciary Committee. "Injuries actually go down because more people use a regulated product." "I'll give you an example," he said. "In 2000, Connecticut, your neighbor, passed a very similar law -- handheld and ground-based sparklers. The Connecticut Department of Public Safety showed a 57-percent decrease in fireworks-related injuries in 2000 compared to the 14 years prior." We made repeated attempts to contact Turner to find the source of his information. He never returned our phone messages or emails. So we tried to get the data ourselves. Turner cited the state's department of public safety. So we went there. After one month, the only data it could provide was well outside the period Turner mentioned in his testimony. And the numbers it did have -- one or two injuries per year reported to the department's Fire and Explosion Investigation Unit -- were ridiculously small. It turns out that there are a lot more, as we discovered when we contacted Connecticut's Department of Public Health and received its data on emergency room visits and hospital discharges classified as stemming from an accident caused by fireworks. Instead of just one injury per year in 2010 to 2014 as logged by the public safety department, the hospital data show an average of 35 people admitted to emergency rooms each year during that period. Their emergency room numbers, available going back to only 1996, show an average of 40.5 fireworks injuries per year through 1999. The number in 2000: 40. Basically there was no change in 2000 versus the average of the previous four years. That's a far cry from a 57-percent drop the year that sparklers were legalized, as Turner insisted, referring to a longer period for which we can’t find -- and he hasn’t provided -- any reliable data. The average since 2000: 43 emergency room injuries per year, which is actually a slight increase from the year when Connecticut legalized sparklers. We tried to add in the much smaller numbers for people whose injuries were serious enough to require hospitalization, using inpatient discharge data going back to 1991, the oldest available. But the state would not give us firm numbers for the years when inpatient discharges were 5 or fewer. But even when we assumed numbers most favorable to Turner, the reduction in 2000 wasn't even close. And if you look at subsequent years, the number of injuries have, on average, increased. 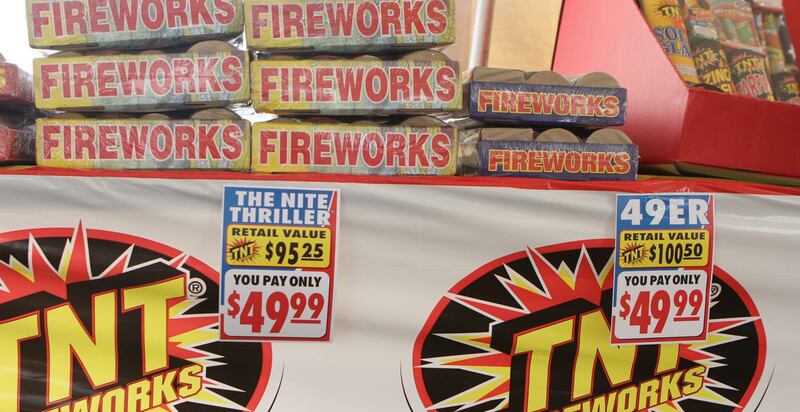 Fireworks lobbyist Eric Turner, contending that fireworks injuries decreased when sparklers are legalized, said that when Connecticut legalized sparklers and similar pyrotechnics in 2000, there was "a 57-percent decrease . . . . compared to the 14 years prior." While Turner stood up and shot off his mouth on Smith Hill, he wouldn’t respond to our repeated requests for information. And when we contacted the agency he cited in his testimony, we found the current database misses virtually all fireworks injuries. Finally, the most reliable source of information -- hospital records collected by the state health department -- shows no significant change in emergency room visits before and after sparklers and similar devices became legal. This incendiary claim is so wrong it rates a Pants on Fire. Published: Sunday, May 24th, 2015 at 12:01 a.m.